Horse stall systems and other top quality equine products from RAMM will complete any barn. 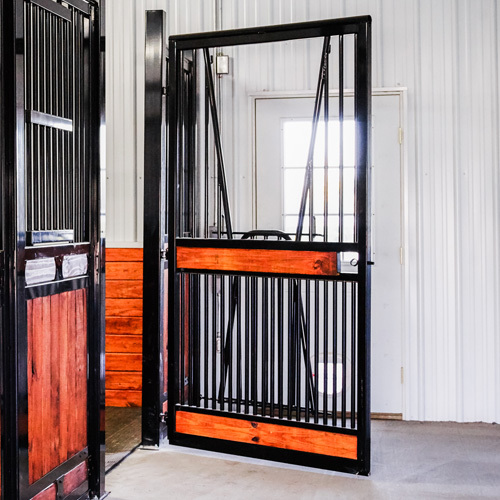 Whether it's a professional or hobby farm, Nobleman horse stalls are sure to add beauty and elegance to any facility. This designer stall system is our most elegant and prestigious. The European flair on this horse stall makes it one of our most popular systems, and customization is our specialty! Our stall designing team will work with you to offer suggestions and answer questions about your project. Each designer stall is built to your specifications and made custom for your horse. The Nobleman horse stall offers sophistication as well as functionality; constructed with heavy-duty steel, which is a RAMM standard. Do you need your stalls to be freestanding or will you have support posts? Would you like the door of the horse stall to be on the end or in the center? What finish is best for you? Also remember to think ahead and plan for what might be down the road when planning your horse stall systems. Call on RAMM for your designer stalls; our expert craftsman and professional team are excited to help you get started. Please call us toll-free at 1-800-434-8456 for more information and a free estimate on designer horse stalls and other fine equine products. Visit our resource center for ideas or testimonials for the your equine barn.